If you are lucky enough to be able to celebrate your parents' 50th Wedding Anniversary you should do your best to make it special and show your parents how much you appreciate and admire them. My siblings and I were lucky enough to be able to celebrate our parents' 50th wedding anniversary with them last year. We began planning for it a year ahead of time! We got lucky because my parents took the whole family (16 of us) on a cruise as part of their celebration. Not everyone will get to do this of course, but what matters is that the family gathers together to commemorate this special day. I can think of no more special way for two people to celebrate and honor 50 years of marriage than by renewing their marriage vows with their family and friends present. 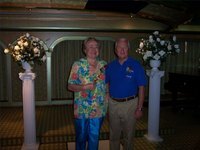 We were able to plan this through our cruise line and they did a lovely job, but you can also plan it through your parents' house of worship or even through any member of the clergy or layperson that you might hire to do a wedding. Remember that a vow renewal ceremony is celebrated just like a wedding! There should be some sort of reception afterward, whether in someone's home or in a reception hall or even a restaurant, and make sure there is champagne for toasting the happy couple and a nice wedding cake. For gift ideas, try to think of something to give them that represents the year they were married. My parents love wine, so one of their gifts was a 50 year old bottle of port showing the year of their marriage on the label. They were so pleased with this special gift. If your parents love to read you could find a special book or even a bible published 50 years ago. If they love antiques you could find a special piece from that year. Just think of what they enjoy and the ideas will come to you. If your parents are financially comfortable then consider making donations to causes that are important to them. You can encourage any guests attending to do the same. If they are not so well-off a great gift idea is a "something-of-the-month" club where fruits, cheeses, beverages, etc. are delivered to them each month for them to enjoy. You could also gather funds from members of the family to help pay for things that will make your parents' lives easier, such as housecleaning service or lawn service. Make a DVD slideshow of their years together. Regardless of their financial situation, any couple married for 50 years would love to gather with their family and friends and watch a DVD showing the history of their marriage. A great idea is to begin the show with pictures of your parents as children and work your way through births, holidays, vacations, etc. to the present. Make sure to include some of their favorite songs from over the years. Copies of this DVD would also make great party favors for all the guests. Don't forget to write at least 6 weeks ahead of time to the White House to request that a greeting from the President be sent to them in time for their big anniversary. Simply go to www.whitehouse.gov for the various ways to submit your request. Remember that the 50th Anniversary is the "Golden" anniversary and use that to inspire more gift ideas.